Hair has struck again. Superficial, to be sure, it somehow manages to work its way into almost every campaign, and this season is no different. Don't apologize, Beth of the Boston Globe! It's really OK to write about hairdos; people do it all the time! I've said it over and over again: hairdos matter. Salon issues destroyed John Edwards' political career long before the, you know, extramarital offspring 'n' such. Helena Cohen, owner of Ardan Medspa + Salon, in Wellesley, said that Gingrich’s hair appears to be teased, and that would add time to the morning routine. “She does that bump on the top that gives it height.’’ Time taken away from kissing babies: about 15 minutes. Celebrity hair guru Sandy Poirier, at Shag, in South Boston, said Gingrich’s hair might take as long as 90 minutes, although he couldn’t be sure. Now THAT is proper hairdo reporting. I stand in awe! I would never have the time for that or the energy. Does she have "people" who do this for her? A professional "hairdresser" ever-ready with product and styling tools at his side? This is why she needs the mobile van! I don't think it's physically possible to do that to your own hair. I would appreciate this same level of reporting about Gubnor Pretty Hair Perry. I've postulated that he may use the same hair care routine as that Duggar guy in Arkansas who has 21 and a tee-vee show on the PBS for Redneck channel (TLC). That method is the use of hair spray with a high amount of adhesive to adhere the hair into the desired shape. Unfortunately I am not a hair care professsional so my comment is only speculation. Clifford Bovier?! REALLY. He sounds like the fey hairdresser character on a 1980s sit-com. does it feel like a bowl of cotton candy? The countours in that picture are amazin gwith the apple and her hair and her face. It's like staring into a spiral. Now, now, Butch Pansy, with a woman of Callista's blow-dried refinement, we don't need to stoop to veiled-but-humorous threats! Besides, I'm pretty sure she's been checking her shampoo bottles for years for these sorts of little "surprises." That was good reporting, too, because it made me actually admire parts of the whole coif, which up to now, I had only been able to absorb as a waxing lunar globulous whole. P.S. Extra love for the Magritte reference! 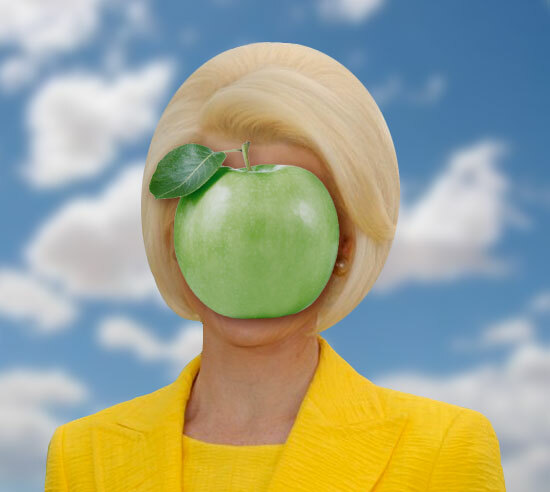 Since Callista appeared on the scene, the quality of life has gone up. And I don't mean just for Tiffany's. Apparently Callista's hairdresser was not one of the staffers that resigned from the Gingrich election debacle. Her hair isn't that odd, have you seen Hillary's hair do's lately, & what about Michelle's??? don't be so petty gals ! Anonymous, not only have I written recently about Hillary Clinton's hairdo, I was highly, highly critical, even dismayed, by it, describing it as "ridiculous" and that it made her appear to be "a 64-year-old woman trapped in a 17-year-old's hairdo... from 1965." Michelle Obama's hair I admittedly have not criticized, but I simply haven't found anything much wrong with it.